Due North, or “Duey,” successfully competed at national hunter events for years. He is a true competitor who has spent the past few years working his way into our child participants’ hearts. 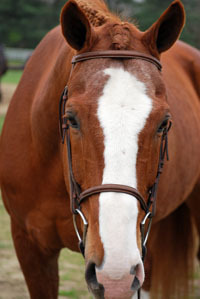 While he appreciates advanced riders, Duey also enjoys teaching novice and intermediate riders. He excels in the hunters both on the flat and over fences. Not likely to stand still on crossties for grooming, Duey does love to be rubbed on his big white blaze and will cuddle—if the time is right.